Starting today! Fun class with field trips! 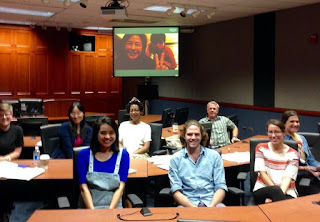 Explore Chinese food customs and culture in the classroom, grocery store and dinner table. Discover the customs, traditions and stories surrounding Chinese food and festivals. Challenge yourself to adventure beyond General Tso’s Chicken. Learn how to put together a Chinese meal and how to pick the freshest tofu. Understand the differences Szechuan and Cantonese cooking and where fortune cookies were invented. Find out the difference between Chinese and Western table manners as well as who General Tso was and why are we eating his chicken. "While there are many worthy causes to support this Giving Tuesday, I hope people will consider [Asian American, Native Hawaiian, and Pacific Islander] AANHPI organizations in particular, as our voices must be as strong as ever to protect our civil rights, immigrant rights, health care, and more," Christopher Kang, national director of the National Council of Asian Pacific Americans (NCAPA), told NBC News. "When only 0.3 percent of foundation investments support AANHPI communities, it is up to individuals to help ensure that we can stand up and speak out." so excited to find my poem/creative non-fiction, "Poignant Truth, Precarious You (and preparing for the Sriracha Apocalypse)," published in Drunken Boat 23 in April 2016. Somehow I missed it back then. Even though they highlighted passages from my poem in their bulk email and introductory essay. This was originally written for the Asian American Women Artists' Association (AAWAA) and its annual art show and poetry reading in May 2014. Drunken Boat calls it "funny and heartbreaking." In “Poignant Truth, Precarious You (and preparing for the Sriracha Apocalypse)” Frances Kai-Hwa Wang speaks in moments of tea. Teapots, tea cups, perfectly made Chai imperfectly remembered, and blue-pot part shattered across a kitchen floor. And she asks, “Or, did I imagine all that?” Not because—it is obvious—she doubts the edge of the shards on the floor, or the hands that made that perfect Chai, but all the subjective atoms between those facts. The magnetic fields and the bacteria and the gravity between them. The fictions we impose and depend upon to leap from nonfictional moment to nonfictional moment and maintain the semblance of a nonfictional self. She states, “I’m not sure,” because that’s what great nonfiction demands. Doubt. Fun class with field trips! These days, when I teach about the arguments American politicians made in the late 1800s and early 1900s about how Asians and Native Hawaiians were not the Americans our founding fathers intended, I always juxtapose that with an image of the founding fathers writing the musical, "Hamilton." We do not choose our families," Kessel said. "But the U.S. does choose to bring adoptees into the U.S. with a promise of placing these children in safe homes to grow up like any other American ... Adoptees are not disposable. We urge the community to call members of Congress and underline the need for a legislative fix now." 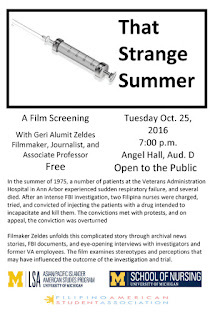 Special screening of the documentary film “That Strange Summer,” with filmmaker Geri Alumit Zeldes, Angell Hall Auditorium D, 7:00 pm. Free and open to the public. Bring your friends! 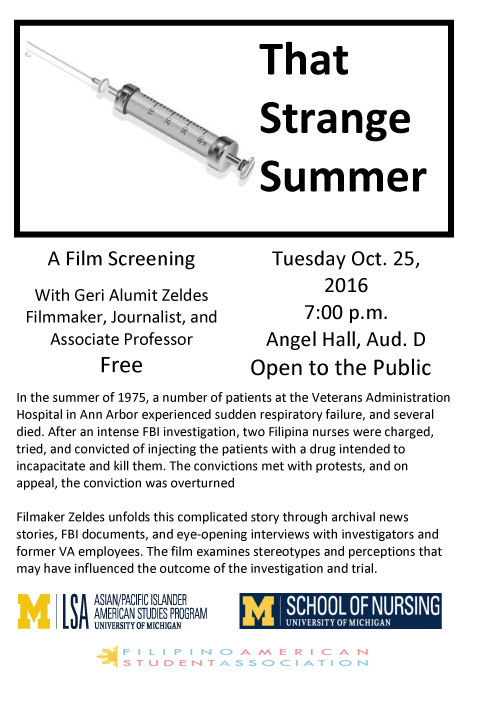 Sponsored by Asian/Pacific Islander American Studies, School of Nursing, and Filipino American Student Association. 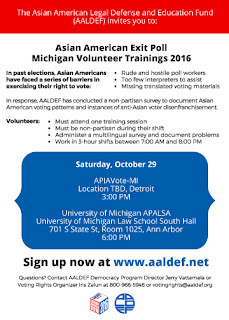 "In recent weeks, racist flyers have appeared on the University of Michigan campus, where I teach Asian/Pacific Islander American Studies as a lecturer. The lesson plans I have prepared are put aside while the students and I discuss these incidents and other incidents across the country. I worry when students say it is not a big deal because they are used to it, because it is not OK to become used to these things." Looking forward to speaking at the Berkeley Narrative Journalism Conference next week-- on two panels! Wisconsin Hmong-American teenager Dylan Yang was sentenced Wednesday to 13 years of confinement and 17 years of extended supervision — a total of 30 years — for the first-degree reckless homicide of 13-year-old Isaiah Powell,according to NBC affiliate WJFW. Harry Hertel, Yang's attorney, plans to appeal the conviction, according to NBC affiliate WEAU. Yay! Allegiance is coming to town! Dec 13 only. "The responding officers were dubious that a hate crime had occurred," Harsimran Kaur, legal director of The Sikh Coalition, told NBC News. "We are urging authorities to investigate and prosecute this case as a hate crime because it was wholly unprovoked, brutal, and his Sikh articles of faith — his turban and unshorn hair — were violently targeted." "We now live in a society where fear and negative assumptions of others run rampant," Zarinah El-Amin Naeem told NBC News. "I started the Headwrap Expo as a way to explore the rich intersection of fashion and faith and to create an experience that is mind-expanding, enlightening, and entertaining." In this introductory class, you’ll have fun and learn to speak Chinese as you explore proper pronunciations, greetings and useful expressions for daily life, people and things. You will also become familiar with the Chinese culture and country, as we cover topics such as history, beliefs, customs and food. "We feel that The Sikh Project Book isn't just for Sikhs," Naroop told NBC News. "It's for everyone. At its core, the project is about identity. Pride. Not conforming. Individuality. In this day and age, no [one] should feel that they need to fit in. Being like everyone else is boring. Staying true to who you are takes courage." 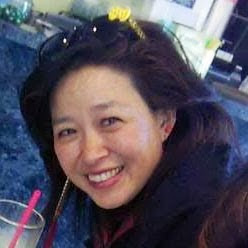 AB-2016 is a landmark law that will ensure all California high school students have an opportunity to learn about their own or another culture's history and importance in shaping the state's past, present, and future," founder of grassroots education news and civic tech site K-12 News Network Cynthia Liu told NBC News. "We hope mutual understanding, empathy, and racial/cultural literacy will be the fruit of this important law. We started Maiv PAC to raise funds to elect candidates who are committed to improving the lives of Hmong and immigrant women and girls," Thao-Urabe said. "As Americans who actively build community we know that improving our lives will improve the lives of our children and our families." "9/11 was a devastating tragedy for all Americans," NQAPIA board member Almas Haider told NBC News. "Its legacy continues to traumatize us in different ways. This action calls attention to the experience of Muslims and those racialized as Muslim, who in the aftermath of 9/11 have experienced an increase in physical and verbal harassment, from our religious centers being vandalized to being murdered in and outside our homes." At that age, I would still be naïve to the future that awaited me and millions others who were born in this country with skin colors, physical features like mine: A future where the night before flying out of any airport, I would always make an hour to shave my beard off; a future where when speaking to airport officials, I’d always find a way to play up my queer identity to the tune of something GLAAD would approve. It’s a future where when I hear about family members of mine — especially elderly loved ones — traveling alone, my stomach is in knots until I hear that they have landed safely. The Sikh Coalition was founded in the immediate aftermath of 9/11 to provide legal aid resources and direct community support to a community that was thrown into crisis as the American public, through the media, began to equate the turban and beard with the face of terror," The Sikh Coalition executive director Sapreet Kaur told NBC News. "Since then, we have evolved into an organization that is creating lasting impact in the courtroom, classroom, community, and halls of Congress on behalf of Sikhs across the United States." "Often people assume hot Asian American men in the media are rare or hard to find, because we don't see enough of them in the mainstream, but once you're tasked with hottie curation, you realize they're everywhere," Tseng said. "And for us, it became a challenge to pick only 12 of them. So I hope we satisfy you with an interesting mix of hotties, and also that you are a hit at your office White Elephant party when you show up with a hot Asian man calendar for the second year in a row." Jay Kronenwetter — the former attorney of Dylan Yang, a Hmong-American teenager convicted of first-degree reckless homicide — is being investigated by the state of Wisconsin's Office of Lawyer Regulation and faces possible suspension of his license, according to Wausau Daily Herald. "By uniting not only the Asian American community in Washington, but many people of diverse ethnic and economic backgrounds, Bob proved that lasting change comes from a united front," state Sen. Bob Hasegawa said in a statement on behalf of the the Washington Democrats. "There are children and families who received health care because of him, who got housing or were able to buy their first home because of him — not many people can say they had such a direct impact on the lives of their neighbors. His legacy will live on in their memories and ours. Like many of my colleagues, I am proud to have called Bob a friend. He was a mentor and moral anchor for our entire community." Excited to be speaking at this conference on narrative longform at Berkeley j school (shhh! Nobody tell them I never write more than a thousand words!) Registration starts tomorrow! "The visit of the President might help the former refugees from Laos and the government of Laos to speed up their long overdue reconciliation process. The war ended more than 40 years ago,"
"This is the first time there will be a Filipino pop-up dinner in the ultimate pop-up city: Burning Man," Yana Gilbuena, a chef and creator of the SALO Series of Filipino pop-up dinners, told NBC News. "We're so excited to bring an official Filipino-themed camp featuring the Philippine eagle jeepney art car, which Andrea [Aguilar] has been conceptualizing and building for the past year to represent the heart of Filipino culture: community." "This is a historical moment for Hawai'i and the world," William Aila, Jr., one of the Native Hawaiians leading the effort for expansion, said in a statement. "This is a bold move, and it took a bold President — born and raised in Hawai'i — to address the serious issues of climate change, the dire state of our oceans and recognizing the cultural significance of the area for Native Hawaiians. Mahalo, Mr. President." "We answered the call from the community to care for Wānanalua [the melon-headed whale]; it was not only our responsibility but it was our supreme honor and privilege to do so," Stewart told NBC News. "It is our hope that in telling our story we can move more collectively for an integrated model of care for Kanaloa[marine mammals and other ocean animals], perhaps a start of a great movement forward in affecting much needed and well overdue change within NOAA and how they navigate here in Hawai'i, where being a native Hawaiian cultural practitioner is not illegal." Thanks to Angry Asian Man for inviting me to guest post on AngryAsianMan.com! 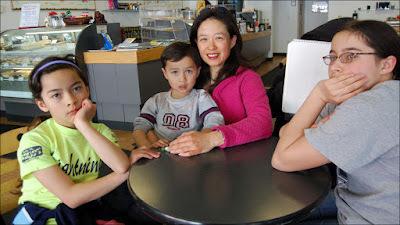 When my oldest child was about 10 years old, I wrote an Asian American parenting book, because I knew everything and had four perfect children. Unfortunately, I did not publish that book then, because my children soon became teenagers, and suddenly I knew nothing and did everything wrong. Now, with two children off to college, one child with a perfect ACT score, and one more who is very tall, I am finally starting to get my confidence back. So when I see younger Asian American friends struggle through the many challenges of raising Asian American babies, well, I just LOL. Here are some of my best unsolicited Angry Asian American parenting tips for raising strong, proud, and ANGRY Asian American children. Pulitzer Prize winning photojournalist Nick Ut, best known for his 1972 Vietnam War photograph known as "Napalm Girl," announced last month that he would be retiring from the Associated Press next March after 51 years. "We learned that students from all AAPI groups are subject to bullying of all types, based on circumstances such as limited English proficiency, cultural stereotypes, religion, and religious attire. However, there's opportunity for all of us to work together to further build upon the resources available, tailor outreach to this community, and implement real solutions to combat bullying of AAPI youth." "The initial investigation suggests that the tragic murder of Amanjeet Singh Toor was a robbery gone wrong," Harsimran Kaur, legal director of The Sikh Coalition, told NBC News. "We remain very concerned about rising gun violence and the rising tide of profiling, backlash, and hate crimes impacting the American Sikh, Muslim, and South Asian communities. Our thoughts and prayers remain with the victim and his family and we continue to monitor this case very closely." Hey look, it's me, moderating a panel and speaking today at AAJA National Convention with Erika Hayasaki and Michele Carson about Asian American and Pacific Islander (AAPI) essayists, longform narrative journalists, public intellectuals, and thought leaders. At the end, we'll be taking a vote to decide what one person gets to be "our" Ta-Nehisi Coates (lol jk, hopefully we get to have more than one). "We live in a diverse world, where we all need to learn about each other and start a positive dialogue about any misunderstandings. [Our] ultimate goal is to educate everyone that we are all brothers and sisters and there shall be no place for hate in our lives and hearts." "Despite the difficult day, the MKHUI [Mauna Kea Hui Petitioners] is honored to join the other protectors who have joined the hearing in a collective legal stand for Mauna Kea, and we continue to remain strong in the spirit of Aloha,"